Yueqing Hean Electrical Co., Ltd.
General：SVC(TND)single-phase high accuracy full-automatic AC voltage Stablizer is one kind of our dominant products, made up of contact auto voltage regulator, servo motor, automatic control circuit, etc. When the power network voltage fluctuates or the load varies, automatic sampling control circuit will send signal to drive the servo motor witch can adjust the position of carbon brush of auto voltage regulator, then, the output voltage will be adjusted to rated value and get a steady start. 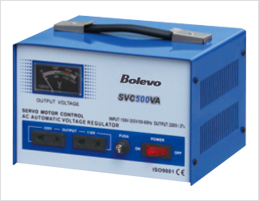 SVC(TND)single-phase high accuracy full-automatic AC voltage Stablizer is one kind of our dominant products, made up of contact auto voltage regulator, servo motor, automatic control circuit, etc. When the power network voltage fluctuates or the load varies, automatic sampling control circuit will send signal to drive the servo motor witch can adjust the position of carbon brush of auto voltage regulator, then, the output voltage will be adjusted to rated value and get a steady start.